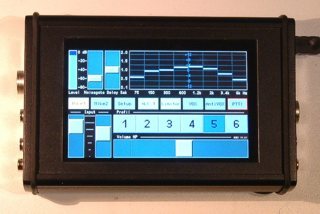 The microphone equalizer RME1 is a digital audio signal processor, primarily intended for editing the microphone signal of radio equipment. The device has various in- and outputs for connecting diverse microphones and to forward the signal to the radio equipment. 2 microphones can be active at a given time and the volume of their signals can be configured and blended together. The PTT signal for activating the transmitter may come from the microphone, a separate key (for example, a foot switch) or activated in the device via a button press or VOX. The complete control takes place via the capacitive touch screen of the WVGA display with glass surface. 6 independent configuration profiles are storable. The microphone equalizer RME1 is available from spring 2015.